App.net, Dalton Caldwell’s proposal for a open developer infrastructure based on a paid model of users, won yet another note of approval Wednesday with the news that the makers of Tweetbot have developed an app for the network called Netbot. While App.net hasn’t hit anything close to mainstream popularity yet — and isn’t necessarily aiming for it right now — the fact that the Tweetbot makers have turned their talents to an App.net client just serves as further validation that Caldwell’s efforts could have staying power. The developers behind Tapbots have created one of the most critically-acclaimed Twitter clients, Tweetbot, that users have praised for its clean design and useful tools. However, the popular app’s days are probably limited, with Twitter cracking down on third-party clients and limiting just how many new users will be able to register with Tweetbot going forward. 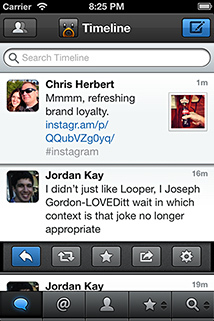 Netbot for App.net looks much like the Tweetbot for Twitter app, with minor differences. Netbot is available for $4.99 on iPhone and iPad, slightly more expensive than the $2.99 Tweetbot for iPhone and iPad. Caldwell introduced App.net this summer not as a “paid Twitter,” as some have called it, but rather as a paid developer ecosystem. While App.net looks very much like Twitter right now, it could in the future could take the form of games or search clients. App.net’s product is the infrastructure, meaning users and developers must pay for access and the platform, in contrast to Twitter’s product, which is the ad-supported content created by users. Under Caldwell’s model, the pricing for entry is high, but once users join, developers are paid to produce useful, well-liked apps, which gives them the incentive to build quality products for the network and keeps App.net from competing with developers and building its own apps. Adding Netbot to the lineup of apps on Caldwell’s platform is a significant moment of validation that the system could take hold. Right now, Caldwell is focused on bringing in paying users who will contribute revenue to the model and allow App.net to in turn pay developers, which explains the high price of entry (although it’s getting cheaper as the user base grows.) App.net hasn’t seen wide adoption outside of nerds and journalists at this point, but if those early adopters are paying and growing slowly, that’s okay, according to Caldwell. App.net as something like computers in the early days — nerds were the first adopters, but eventually average people started buying them to play games and run software. We’ve been working very closely with App.net. Their goals of always putting users first resonates with what we believe at Tapbots. Even though App.net is currently a small network, we expect big things from them and are proud to be a part of the community. I’ve always loved Tapbots. Now that they’re working with Dalton Caldwell’s App.net, I’m pleased to see how things progress.